2015 World Top 30 Busiest Airports By Passengers – Key Statistics (Data from International Air Transportation Association (IATA) and Airport Council International (ACI)). Total passengers increase of 6.1% outpaced available seat growth rate (measures growth of an airline flight’s passenger carrying capacity) of 5.6%. As a result, load factor (measures capacity utilization) moved up by 0.6% in 2015 to a record 80.3% systemwide. Revenue Passengers Growth Rate (measures growth of an airline flight’s revenue passenger by distance travelled) increased from 5.9% to 6.5%. This represented a full 1% better than 10-year average annual growth rate (IATA). The Top 30 busiest airports combined to handle over 1.802 billion passengers in 2015. This is an increase of 5.6% over 2014’s figure of 1.707 billion. These airports represented 20.24% of total passengers carried during the year which was slightly less than 2014. A few reasons for this decrease include: 1. airlines introduced new routes to secondary cities using fuel efficient aircrafts like the new Boeing 787 and Airbus A350, 2. passengers are looking for travel alternatives from the top congested/more expensive airports, and 3. population growth outside of key cities facilitates the expansion of second and third tier airports (such as in China and India). The graduation class of 2015 required a minimum of ~43 million+ passengers to make the top 30 list. This represented a 15% expansion over a five year period. This trend will continue in 2016 with the minimum likely pushing over 46 million. The Top 5 featured four old guards and a new entrant. 1 – Hartsfield-Jackson Atlanta International Airport (ATL) retained the title with the most passengers carried for the 17th consecutive year. It also earned the distinction as the world’s first airport to handled over 100 million passengers annually (Refer to our coverage here). The airport is home to Delta Air Lines (DL) which has a greater than 80% market share there domestically and internationally. The airport is in a midst of US$9 billion expansion until 2030 which will create new gates at Concourse T, a new Concourse G, parking, cargo facility improvements and a new sixth runway. The airport is likely to retain the world’s busiest airport by passenger title until 2019-2020. 2. Beijing Capital International Airport sat at the runner up position since 2010. The airport serves as a hub for Air China (CA), China Eastern Airlines (MU), China Southern Airlines (CZ) and Hainan Airlines (HU). Growth has diminished over the years as the airport is experiencing capacity congestion. The Chinese government is in the midst of building a new airport south of the city in the Daxing District that will be able to handle 45 million passengers annually when the first phase opens sometime in 2018/19. 3. Dubai International Airport moved up from sixth to third in 2015. This is the first time a Middle East airport made the top 5. The airport is hub to Emirates (EK) which uses the airport has a major connection hub for most of its international traffic and flydubai (FZ). The airport just completed construction of Concourse D which brings capacity up t0 90 million passengers. The Dubai government has plans to expand its Dubai World Central – Al Maktoum International Airport (DWC) located in Jebel Ali (southwest of Dubai) to manage additional future growth. 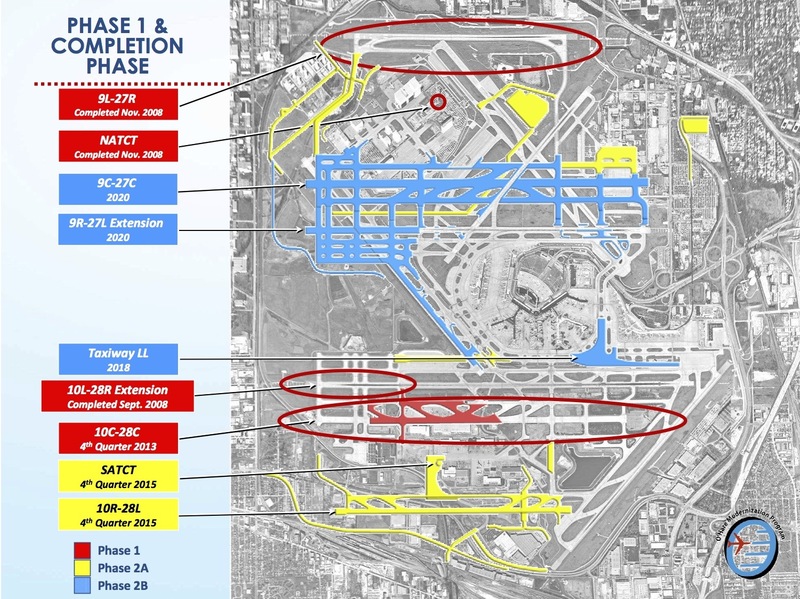 When opened in late 2020s, the expansion would be able to handle between 160-260 million passengers with five runways. 4. Chicago’s O’Hare International Airport used its best growth in the last 15 years to move up to fourth. This is its highest position in the last five years. Total passengers served beat the previous record set in 2005. The airport serves as major hubs for American Airlines (AA) and United Airlines (UA). Chicago’s Mayor Rahm Emanuel unveiled plans to build a sixth runway at the airport which will be completed by 2020 at a cost of US$648.5 million. The east-west runway dubbed 9c/27C will be 11,245-foot-long and 200-foot-wide and will be capable of handling the Airbus A380. The airport is actively working with AA and UA on other terminal expansion plans for the next 10 years. 5. Tokyo Haneda Airport (HND) located in downtown Tokyo landed in the fifth spot. Haneda suffers from airspace restrictions due to its close position between Yokota Air Base to the west and Narita International Airport (HND) to the east. Due to these airfields’ requirements and noise concerns, its flights generally arrive and depart using circular routes over Tokyo Bay. As of 2015, there are plans to add a new arrival corridor over western Tokyo and a new departure corridor over Yokohama, Kawasaki and central Tokyo, which would be limited to afternoon hours (Refer to news). As the corridor is finalized, both HND and NRT will build new taxiways to build additional capacity ahead of the 2020 Tokyo Olympics.